Dr. Hermann Fritz of the Georgia Institute of Technology is working as part of a research team investigating the Indian Ocean tsunami of December 26, 2004. The team includes members of the Tsunami Research Center at the University of Southern California (USC). 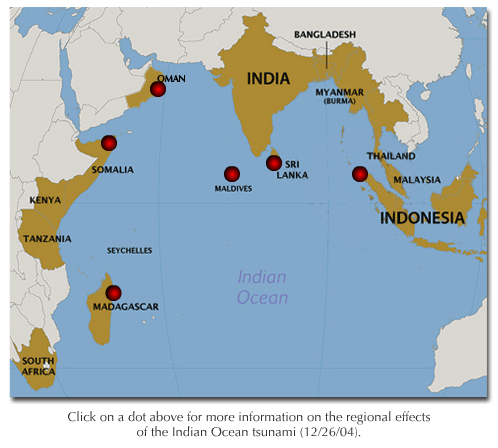 Sponsors of this research include the Earthquake Engineering Research Institute (EERI) [Sri Lanka and the Maldives] and the National Science Foundation (NSF) [Sri Lanka, the Maldives, Oman, Sumatra and Madagascar], the U.N. Educational, Scientific and Cultural Organization (UNESCO) [Somalia and Sumatra] and Georgia Tech .